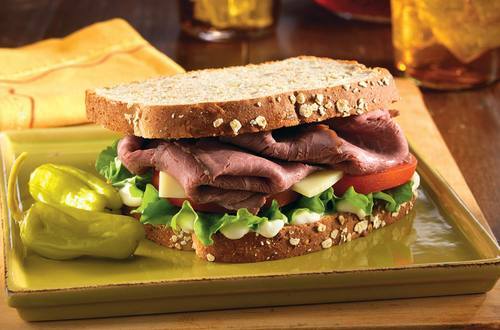 Enjoy a hearty roast beef sandwich with provolone by following this easy step by step recipe. 1 Combine Hellmann's® or Best Foods® Light Mayonnaise with garlic powder in small bowl; spread on one bread slice. Top with roast beef, cheese, lettuce, tomato, then remaining bread. For a great twist, try using 1/8 tsp. dry wasabi powder instead of garlic powder.